Early in the hill climb season, I did well in some Swindon R.C. short hill climbs. After doing well on a 1 minute and 2 minute climb, I was gaining confidence in my ability for short-distance hill climbs. That week, I was training at Britwell Hill, near Watlington. I think the course record was about 2 and a half minutes. On this particular occasion there was a headwind, but I went full pelt right from the start. For the first minute I was averaging over 500 watts and flying up the hill. After a minute, the pain really kicked in. After 90 seconds, I was absolutely blown up and the climb just got steeper and steeper. It was torture to keep fighting up the steep climb, when you’re muscles are shot. It took over two minutes and a half. My recent pride at doing well in short hill climbs took a battering. That was the worst interval, so much pain and discomfort. When I looked at the climb using data, I found that my heart rate peaked after 90 seconds. After than the HR declined – showing my muscles were so tired they couldn’t even use the full amount of oxygen. The interval sent the muscles into over-use. I think after that interval, I did another 6 intervals with very little recovery in between. The legs were burning all the time. Afterwards, I could barely cycle home at 100 watts and took three or four days to recover. I never repeated that interval session. Maybe it’s a good interval session to do if you can stomach it. But, you need to be super-motivated to do it properly. Also, I wouldn’t recommend doing it too often because it is must be causing more muscle damage than usual. Choose a hill which takes 2-3 minutes, but gets steepest at the top. Something like the Rake would be ideal. Then sprint from the start, and then when you’ve blown up, keep struggling up the steep bit as fast as you can. Basically, read this post – Technique for riding up hills and then do the exact opposite. If that doesn’t sound an appetising training session, probably you are very wise. But, it’s worth doing once or twice just for the experience. I had forgotten about this experience, but I was reading about the 1985 National Hill Climb Championship held at Challacombe. A short steep climb in North West Devon. It is a similarly designed climb – flat introduction, then 25% at the top. 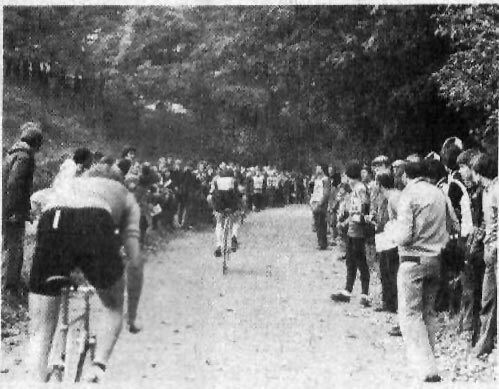 The Cycling Weekly report from 1985 is full of competitors saying that after their experience at Challacombe – they will never do another hill climb! I’ve tried that pacing strategy on the Rake a few times – by mistake obviously! I’d like to get up there in under 3 minutes one day, not got remotely close yet. I think many people end up doing that pacing strategy on the Rake! Hello. I typed in Challacombe hill and the search brought me here. Amazing to see you mention the 1985 hill climb championship which was the last race I entered. After a a good few years hill climbing I had come to the end of the road and got into walking up mountains instead (still going up hill!) Great site – thanks. Cheers John. I was nine years old in 1985.